Yesterday, we saw how a Chinese newspaper was irate about the lines faced by U.S. voters — lines entirely avoided in a country that denies its citizens any right to select its leaders. Now, Iranian President Mahmoud Ahmadinejad has objected to the cost of the election — citing the runaway spending on the campaigns as a “battleground for capitalists” at a democracy forum. It is unclear why Ahmadinejad was even speaking at a democracy forum except as the balance against those who like democracy. 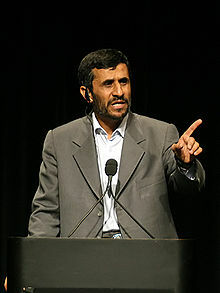 Nevertheless, Ahmadinejad has certainly been able to suppress both democracy and its costs through the use of thug squads and widespread arrests. Irony seems lost on the Iranian leader who previously criticized England for the mistreatment of protesters. Undoubtedly Shano, but birth certificate and unfounded allegations that voter fraud was widespread this year because the white rich guy backed by white rich guys didn’t win? Come on. We both know that the birth certificate issue is both dead in the water and simply a code attack for racists and that voter fraud in general is a non-existent issue. They are unrelated to the debacle of TARP and TARP was Bush program Obama got stuck with. I’m all for legitimate criticism of Obama. He’s a civil rights nightmare. But not all criticisms are created equal and not all come from the same place. I wonder if Stromfront has noticed their village idiot is missing?